I came home from parent-teacher conferences to an Indian Holi festival. 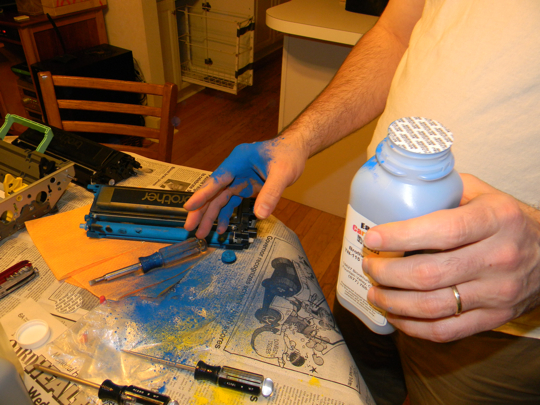 Lloyd was replacing toner all on his ownsome. I arrived just in time to document. 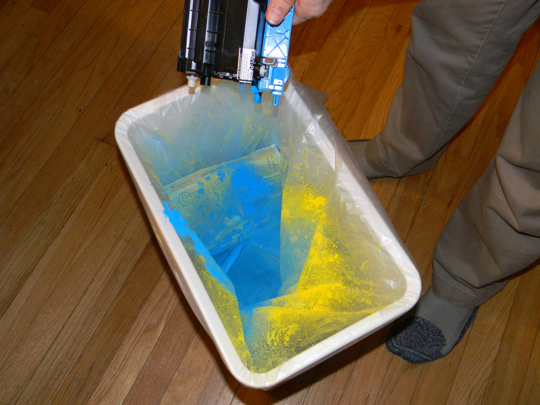 You have to take out the plug from the cartridge and dump out the old toner before you put new toner in. We were surprised at how much seemed to still be in the cartridge, but not surprised at the beautiful mess. At this point I decided to ‘help’ and did not go through Lloyd’s Seventeen Sacred Steps of Proper Refilling, and broke a seal before it was time. When he shook it, there was a problem. Sorry, man. I can’t get the movie to load, but I wish I could show you how crazy fine this powder is. When you shake it up in the bottle, it looks like a liquid sloshing around, then it settles back down and looks powdery again. It’s amazing. So, a good night’s work, and by refilling his own cartridges he’s that much closer to having enough money for a Prius. Good luck, mister. I already have my recliner money. Brightly colored toner would be a great way to make your house look better. Got a pile of junk? 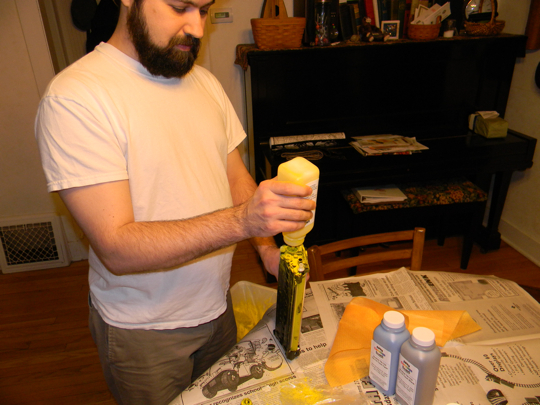 Cover it with bright yellow powder! Does your floor look dirty? Make it intensely blue! That is awesome! I would love to come home to a Festival!! Is that powder toxic? Should you have been wearing your nose sock Lloyd?